Endurance Magazine is the premier resource for your active lifestyle. 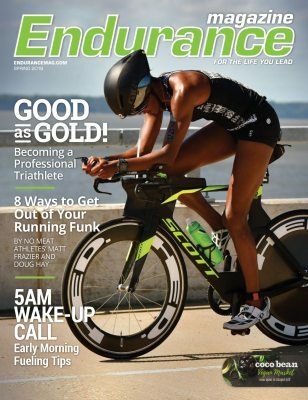 Focused on educating, inspiring, and motivating athletes of all levels and abilities, Endurance Magazine offers readers compelling and immediately useful editorial on a quarterly basis. Editorials include Inspiration, Getting Started (for beginners), Running, Cycling, Swimming, Triathlon, Women in Motion, Youth Fitness, Mountain Biking, Adventure, Nutrition, Bodywork, Strength Training, Mental Fitness, weekly lists of active Things You Can Do EVERY DAY, Rides and Runs of the Month, and the most comprehensive events CALENDAR for the region. Each quarter we reach over 120,000 readers via over 900 locations. In addition, we deliver thousands of issues to registered race participants in their race packets each month. Annual subscriptions are also available.